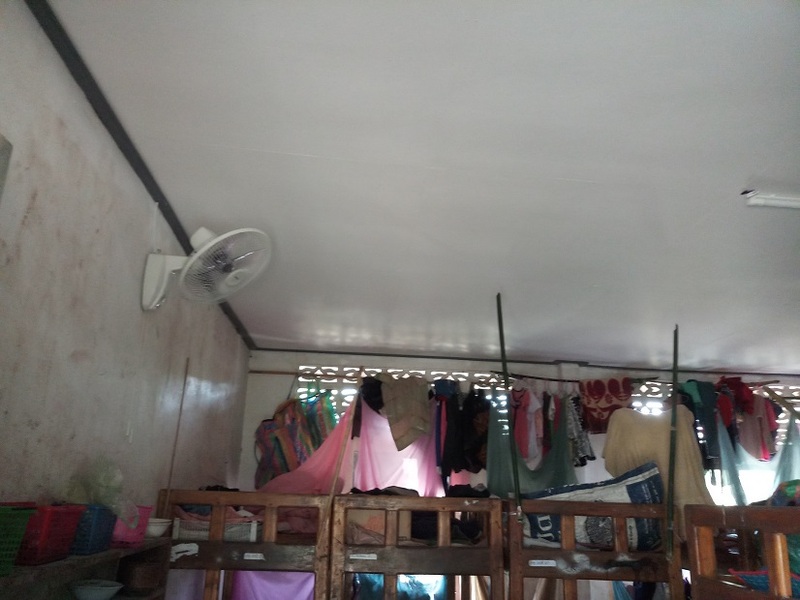 It is always great to get feedback and photographs to show the difference our donation has made to the lives of those less fortunate. 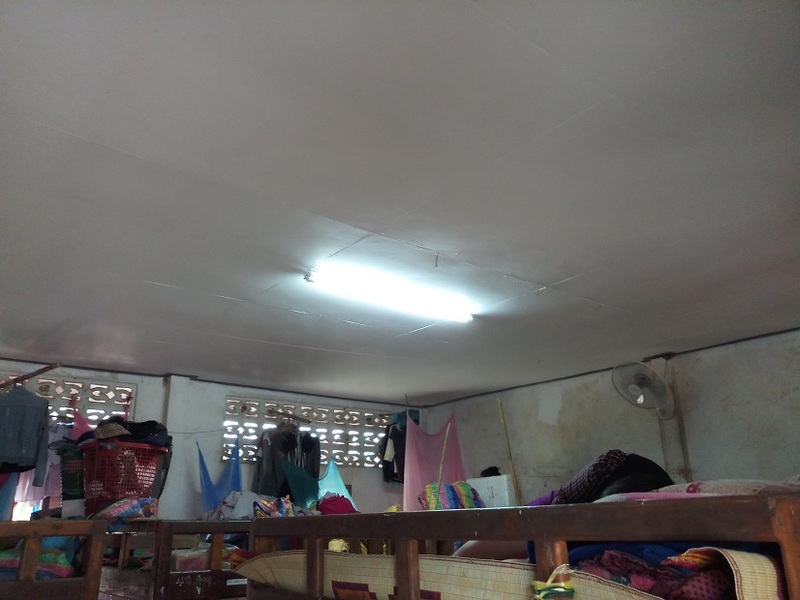 These photographs provided by Brian Pearson show a picture of a dormitory at Suan Luang Ophanage in Laos before upgrade and then 3 of the dormitories with new ceilings and lights, funded by Gold Coast Rotary. 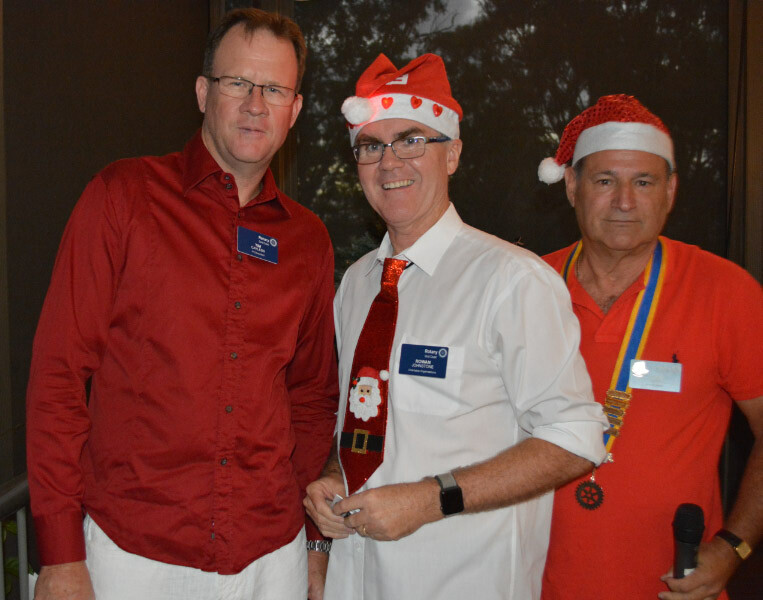 Thanks to President John and team for organizing a great Christmas function for our Rotary Club. John was delighted to induct 3 new members, Tim, Vanessa and Darren to start the night off. Fun was had by all, along with the usual friendship and laughter among those attending. Entertainment by the Salvation Army band and carols by the Blenders was first class. Particularly impressed by the ‘curtain call’ of the Blenders to sing Rudolph The Red Nosed Reindeer for the little girl visiting with her family on a Ken Bromley Wounded Service personnel holiday. President John with help from Tracey conducted a very interesting ‘Secret Santa’. Check out all the action in the photograph album. 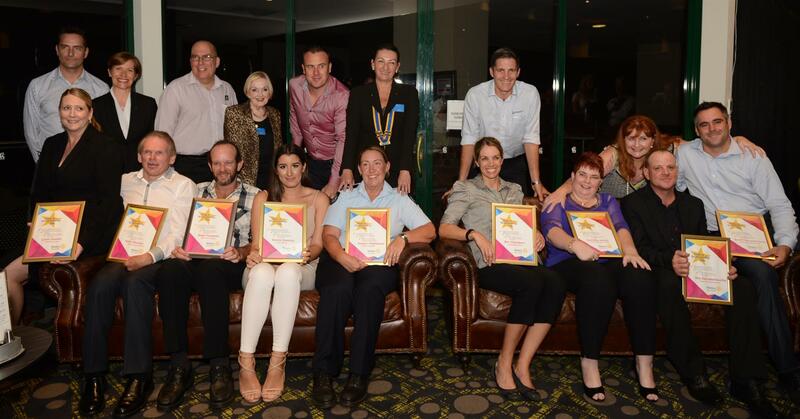 Fantastic evening, our Club presented awards to 8 worthy recipients representing 8 local businesses. All nominees were presented with a Rotary Pride of Workmanship glass trophy, each awardee gave us a short talk about their achievement. Congratulations to the awardees for a job well done. 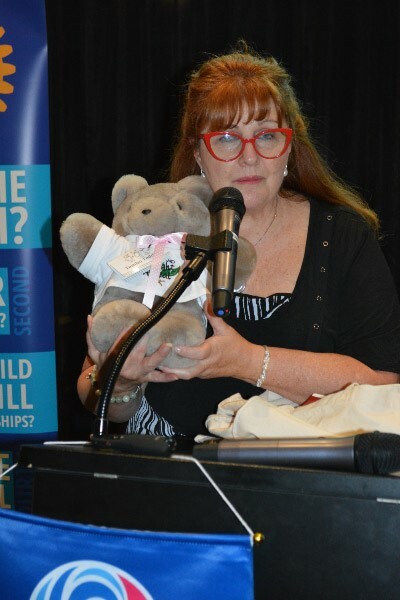 Kathy raffled a cute Teddy Bear and raised $675 for the Drought Relief effort in Western Queensland. It was good to see a strong support from the Club with 23 members in attendance plus 49 guests. A special thanks to Past President Kathy Hogan, and her team, for making this event possible and for being the MC for the evening, to Rob Ffrench who introduced and explained the concept behind Pride Of Workmanship and all the volunteers for their assistance. 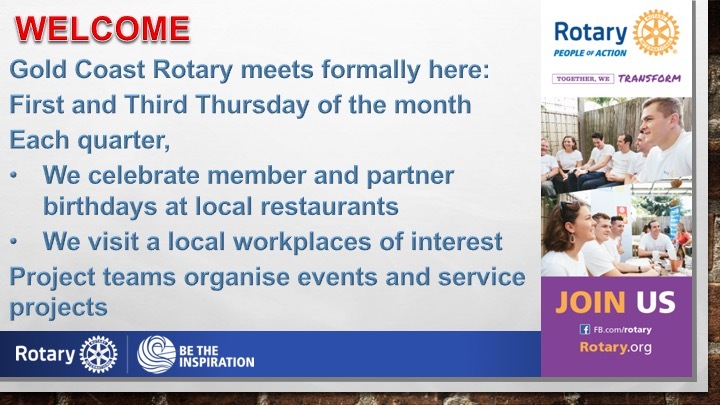 As President I did a short presentation about Rotary and about our Club. What perfect weather for the Ramble - blue skies, sunshine but not too hot for the 20 Ramble teams and 55 volunteers in orange. Although the number of participants was disappointing, those that took part certainly entered into the spirit of the event in their colourful costumes and wonderful fundraising. 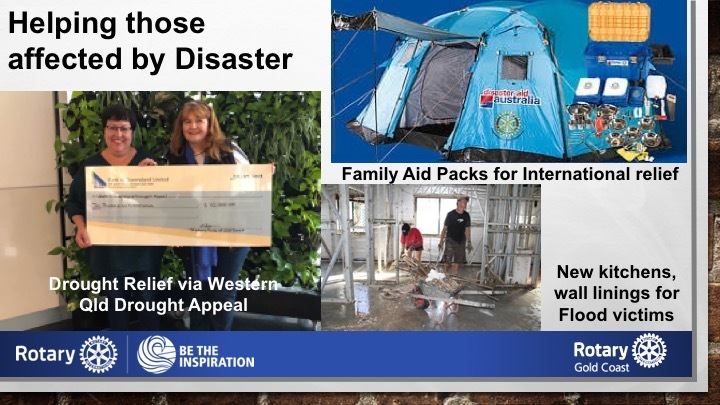 Over $6,500 was donated to the nominated charities by the teams and their supporters. Due to the poor level of registrations, the 3-hour event was cancelled and combined into a single 2-hour event - this meant a later start and shorter event and was much appreciated by the volunteers manning checkpoints! 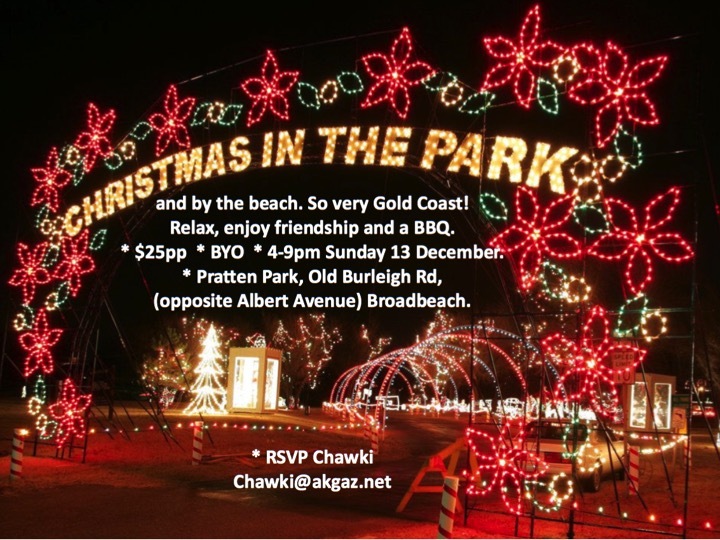 The event started at Appel Park on the Nerang River with 25 checkpoints scattered from the Isle of Capri (very lonely as only one team visited them) through Surfers Paradise and up to Macintosh island. Not all checkpoints were multi-choice questions this year. 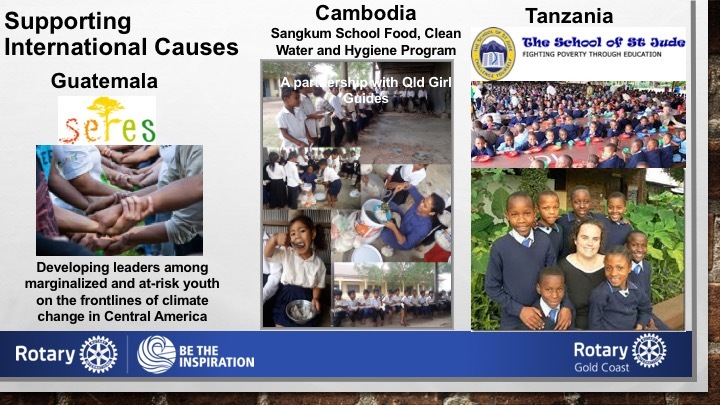 At 7 sites, the team had to complete a physical challenge, which created a bit of fun, especially for the children. Once again the 1st and 2nd place-getting teams were separated by the points gained from donations. Only 1 point! Congratulations to the Monster Mayhem team who won the 3-day Scenic Rim walk donated by Spicers Retreats. A 12-month family pass for tennis and mini golf at KDV Sports was a just reward for 2nd placed Nipapotamus. Pirate team 'Yo Ho Ho and a bottle of Ramble' were hard to overlook as the craziest dressed team and earned a half day brewery tour with Hop On Brewery Tours. Other teams shared the random draw prizes from Top Golf and Lana Noir Photography Studio. The winners of the best corporate team and highest fund-raiser was the 'Little People' - an advertising package from 94.1FM and a consultation from CorpMentis. Thank you to all our prize sponsors and to Kevin and Lindy Campbell for once again sponsoring our volunteer shirts. Volunteers make 30,000 beds for charity! 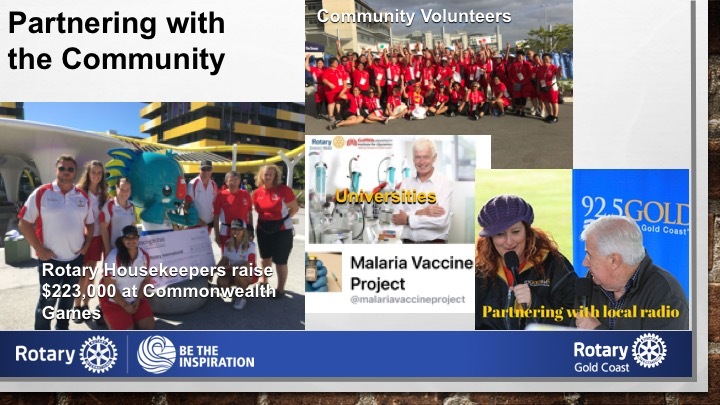 Rotary District 9640 had an active team of 180 housekeeping attendants at the Athletes Village of the recently concluded XX1 Commonwealth Games on the Gold Coast. The return was a massive $223,360. 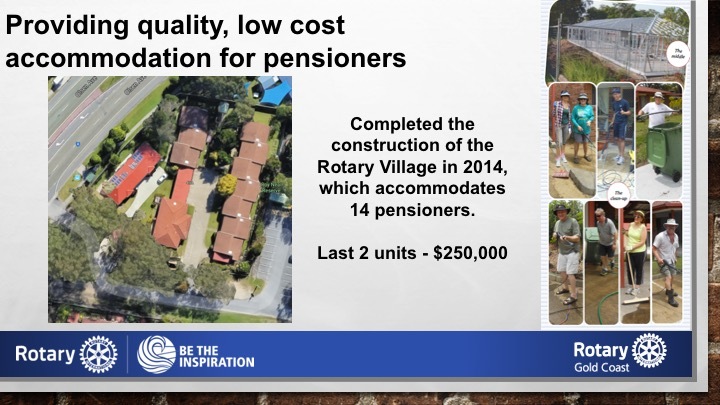 It wasn’t easy in more ways than one but Rotary came out winning Gold! 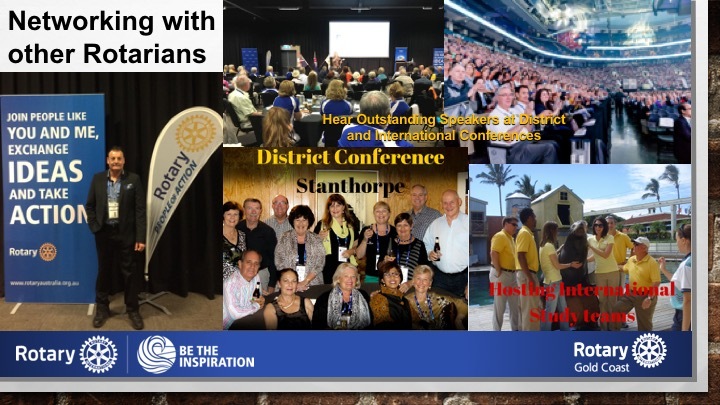 PDG Brian Heaton suggested that Rotary could become housekeepers to the Games Village as happened in Melbourne in 2006 & in the last London Olympics. PDG John Wigley who had been D9800 District Governor in 2005/ 2006 and Rotarian Bill Dagg, who had co-ordinated the Melbourne Games housekeeping were flown up from Melbourne to brief clubs. 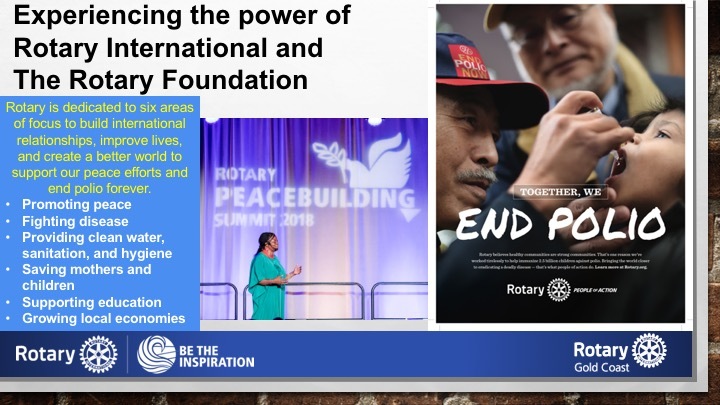 As the successful housekeeping company, Incognitus needed a commitment within 3 weeks, a mad scramble resulted trying to get Rotarians to commit with little knowledge of the degree of involvement. Many had decided to leave town due to the scare tactics on traffic chaos & a lot had already committed to volunteering work during the Games. Our potential workforce was severely diminished right from the start. 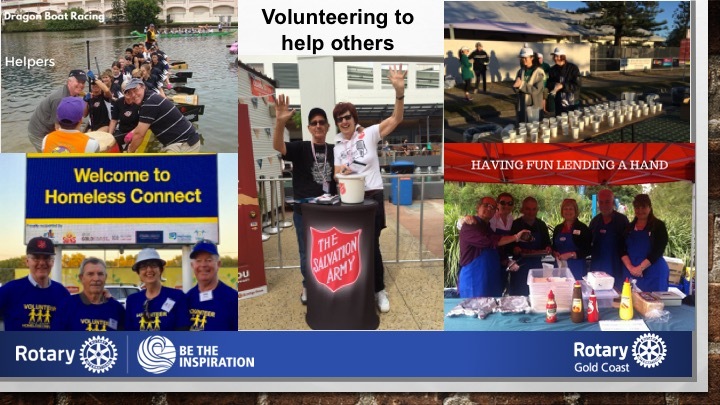 We had to go through a rigorous accreditation & training process but we ended up with 22 teams of 5 people per team & a total of 180 volunteers that included 35 Rotarians from Currumbin-Coolangatta-Tweed, Gold Coast, Parkwood, Runaway Bay, Surfers Sunrise, Summerland Sunrise, Warwick Sunrise, Toowoomba North (D9630) & Sunnybank Hills (D9630) plus volunteers from several charity & church groups. Church groups from the Pacific Islander Communities of Brisbane and the Gold Coast provided a large number of the volunteers. What did we do? District Governor Darrell worked for 10 days, where he was a stripper in the first couple of days. That is one who strips bed linen from beds - not the other type of stripper!. Then he made beds all day on some days or made up linen packs. His exit day, was toilet & bathroom cleaner. Many of the volunteers would do their housekeeping shifts & go back to their normal jobs working late into the night. Everyone pulled together with great camaraderie. Was it worth it? Yes. At the end of the games, Paul Lovett, CEO of Incognitus presented a big cheque to Assistant Governor, David Baguley who coordinated the volunteer work force. 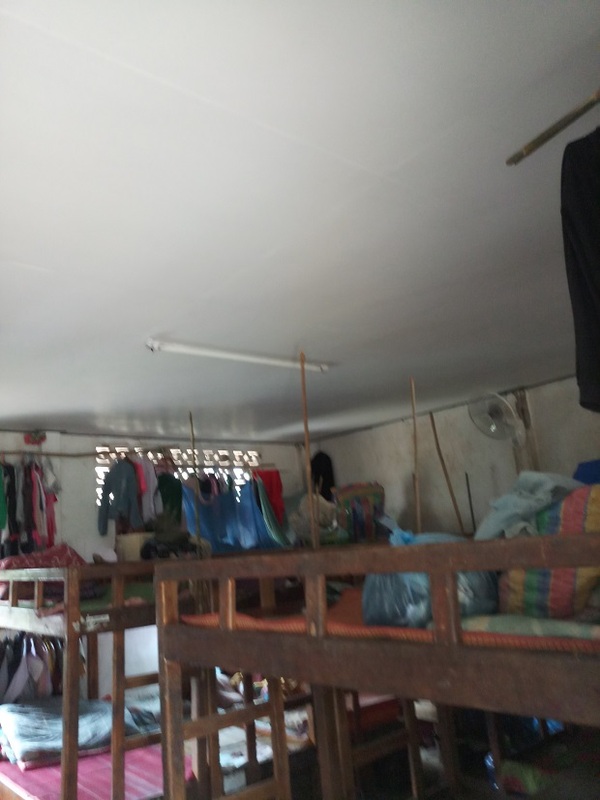 Paul praised the team & said that we were the best housekeepers that he had ever had. Providing crises care & support to families of patients in intensive care at Gold Coast University Hospital who have arrived outside of the Gold Coast at short notice to be with their loved ones in hospital. RC Surfers Sunrise’s Wheelchair Project making wheelchairs for children in undeveloped countries out of discarded bicycles. Australian Rotary Health PhD Scholarship in Mental Illness. 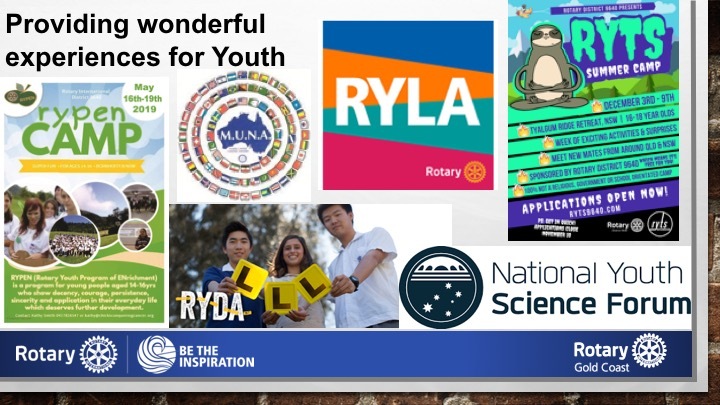 Youth with a Mission Rugby Plus using rugby as a vehicle to train young men & women at home in Fiji & giving them an opportunity to serve in regional & outback Australia in communities that love the game & encourage the youth with healthy thinking, eating & living based on Christian values. St John’s Crisis Care in Surfers Paradise. Sponsorship of Rotary’s Youth Driver Awareness program for a school. 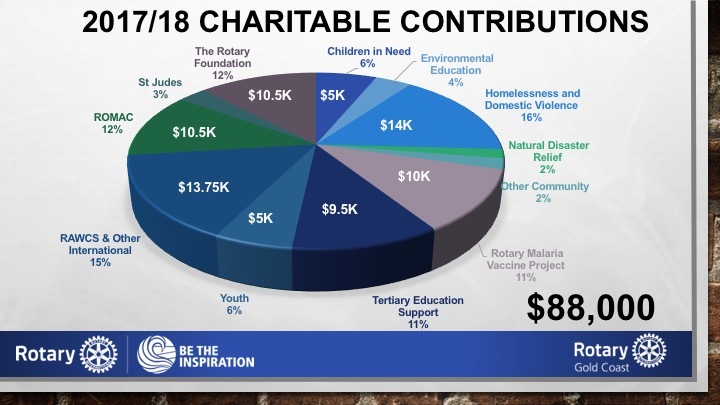 Rotary’s Polio Plus & Donations in Kind, to name a few. 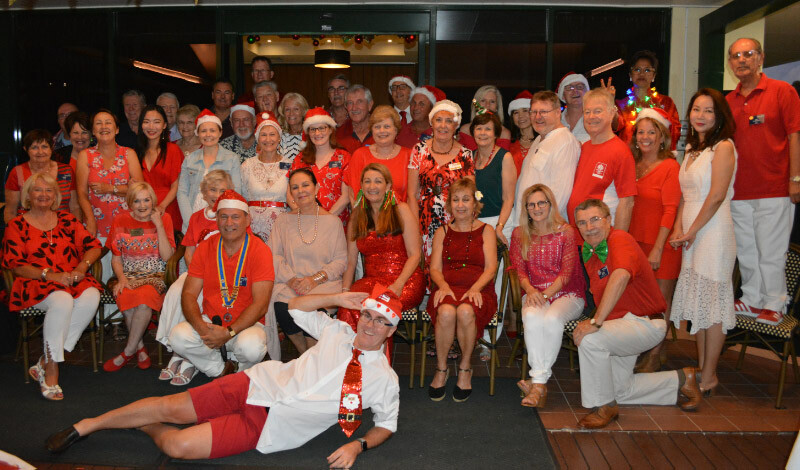 Our Gold Coast Rotary Christmas celebration was a great event. Thank you Rowan for organising the Salvation Army Band, Eddie and the Blenders, It was wonderful to share the evening with one of our holidaying Ken Bromley families. And a special happy birthday to all who are celebrating their birthday in December. Special thanks to Jean Pierre D'Anna and Chawki for organising a great evening. The night is best shown in pictures - check out the Christmas Meeting 2017 Album! 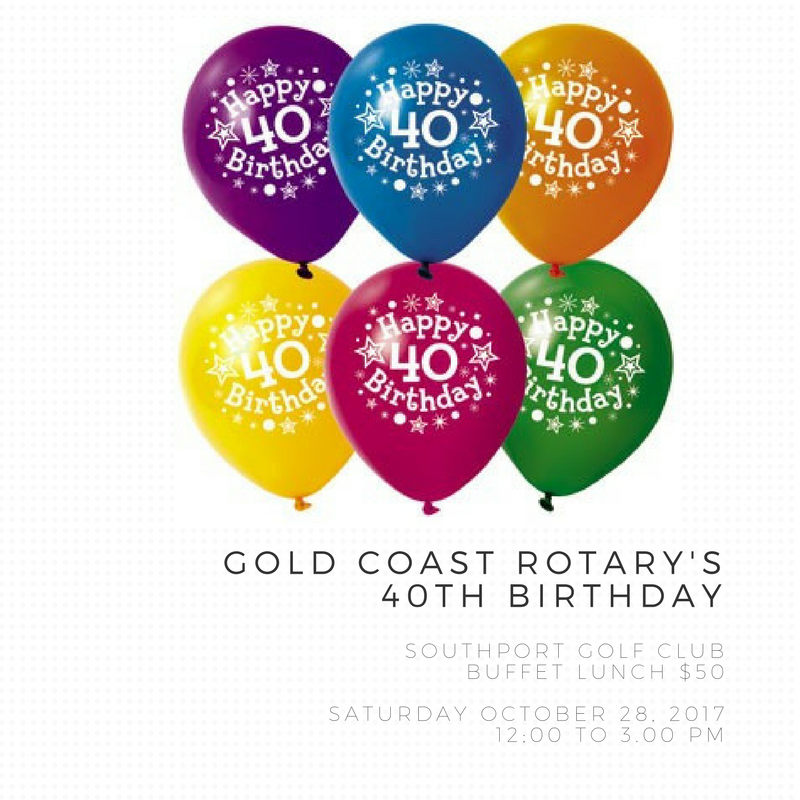 Members, partners and friends are invited to join the Club for a relaxed luncheon at the Southport Golf Club to celebrate and reminisce about 40 years of service to the local and international community. 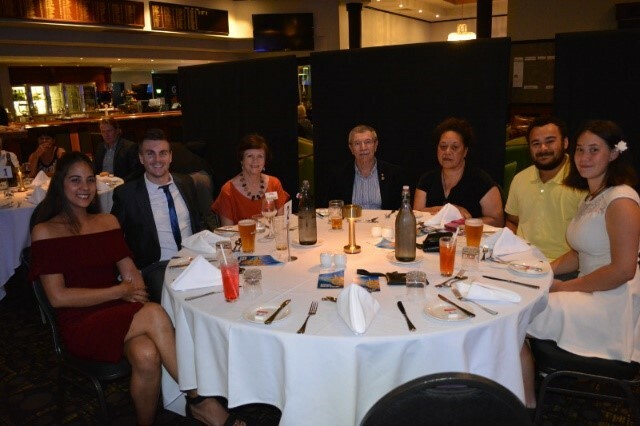 The challenge is to locate and invite past members and partners of Gold Coast Rotary, Surfers Paradise Central Rotary, Gold Coast Central Rotary, Surfers Paradise West Rotary and Bundall Rotary and make this a great reunion. David Baguley would welcome contact details so an invitation can be sent. It’s going to be a fabulous night!!! 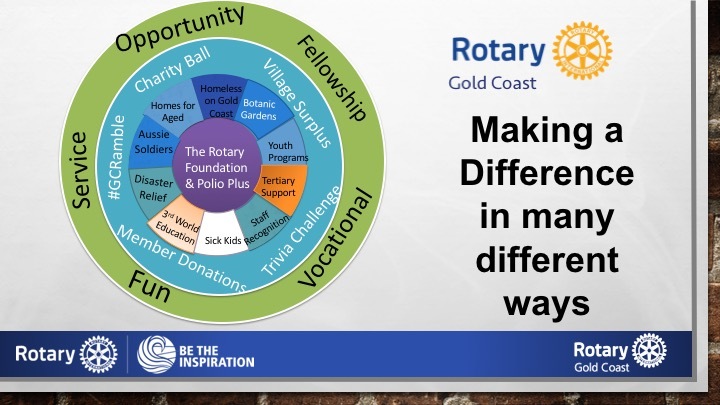 The Rotary Club of Gold Coast together with local radio station 92.5Gold FM are hosting a Gala Ball at the Gold Coast Convention and Exhibition Centre at Broadbeach on Saturday June 10. 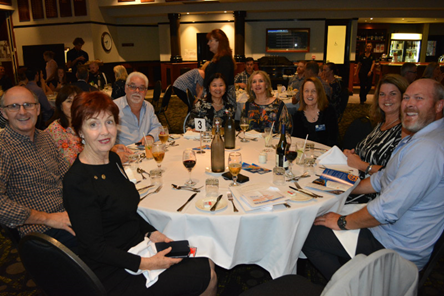 It will be a night to raise money for the children’s wards of the Gold Coast University Hospital and The Tweed Hospital, Griffith University Malaria Research and ROMAC (Rotary Oceania Medical Aid for Children). Apple Marketing, Clear IT Solutions, Master Sweets and The Advanced Group are our major sponsors along with so many of our own club members who have very generously provided a huge array of items including vouchers, gift certificates, restaurant dinners to wine deals. There is something for everyone. With over 100 silent auction items and several live auction pieces bidding will be fast and furious. Bidding will be via an app designed specifically for the night so we know we are going to see some serious auction action! Being able to watch bids in real time means no-one will take their eyes off items for a minute! Gotta love dressing up, having fun raising money and dancing to fabulous hip swinging music provided by Groove Doctor. So, mark it in your diary and we look forward to seeing you there. To all our wonderful volunteers - a great big thank you from the Gold Coast Ramble. We could not have done it without you and your effort was not only appreciated by us, the organisers but also by the participants. I just wanted to say that the Gold Coast Ramble was really fun, and really well organised, and thank you all for all the work you put in. Organising the maps, clue sheets, the app, the "go manual" contingency plan in case the app died, it was all great. Even the clues on the clue sheet were just the right amount of cryptic and mysterious, and I really loved the vollies at every clue station -- they were all super friendly and encouraging and helpful. So thank you very much. It was fantastic fun, and I really hope it becomes an annual event. We learnt some lessons from a few hiccups - like putting a couple of checkpoints in the wrong position (Yidan and Josh get the prize for loneliest checkpoint volunteers! ); putting incorrect map co-ordinates on another; having a couple of confusing questions and placing some of our checkpoints in locations exposed to the afternoon sun (our apologies to those volunteers affected). Overall though, the event and technology worked as we planned it, even the manual back up was actioned for one group. The wet weather in the week leading up to the event probably affected registrations so we ended up with 58 teams (220 registrations). It was a dress rehearsal for the future when our numbers grow to 2,000 or 5,000 - we would not need any more volunteers than we had on Sunday. 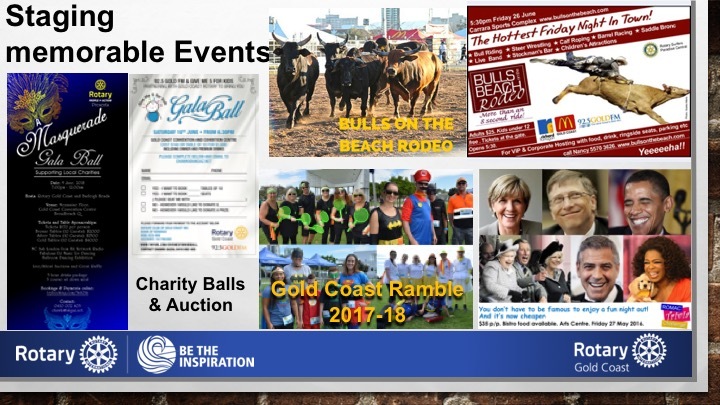 We are likely to make a small loss on the event itself but everyone enjoyed themselves; the 'Gold Coast Ramble' brand has been established and the event enabled the nominated charities to benefit from donations of $7,000, which was the primary purpose of staging the event. All the participants had fun and the wonderful prizes were much appreciated. A full list of team scores will be available soon. 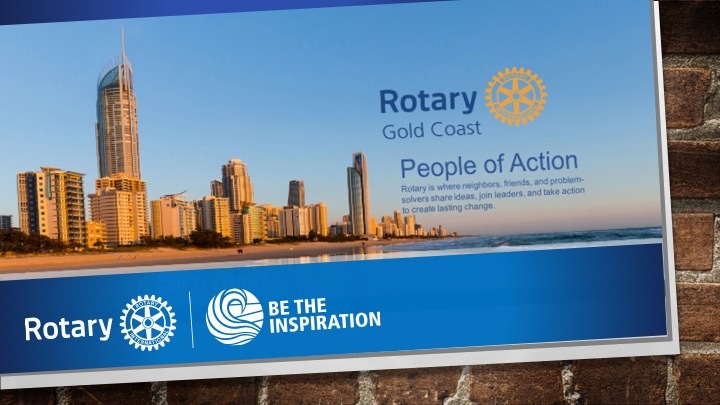 Gold Coast Rotary in partnership with Surfers Sunrise Rotary and Griffith University Satellite Rotary clubs will stage a major community event, the Gold Coast Ramble on 26 March 2017. 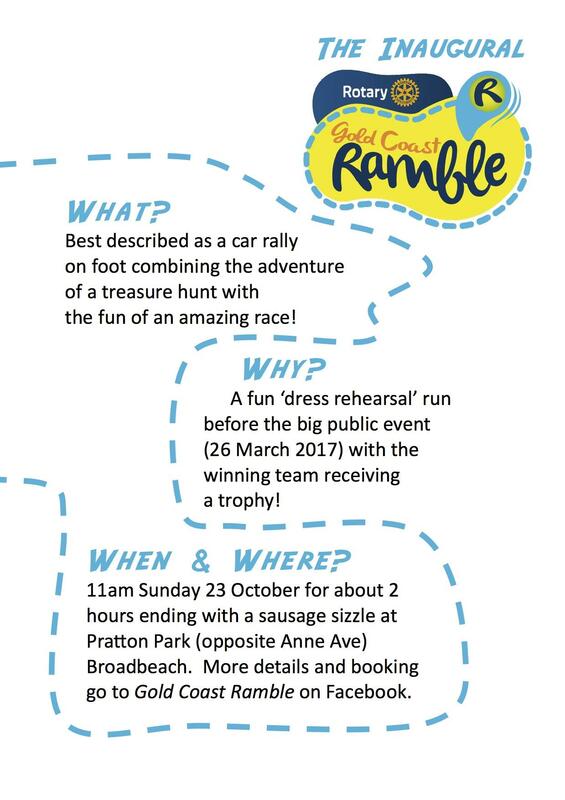 The success of this event depends on the smooth functioning of the booking and sponsorship on-line systems, the Gold Coast Ramble App and the processing of competitors. So the event on 23 October will be a test of these systems whilst having some fun with Rotary groups from other clubs. Any funds raised will be donated to Polio Plus as 24 October is World Polio Day. 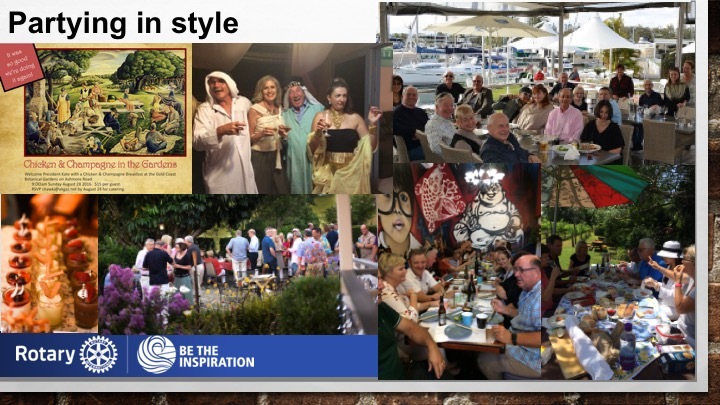 Wonderful weather, wonderful food and a great venue for a picnic brunch - more than 30 members and partners gathered in the Gold Coast Regional Botanic Gardens to welcome President Kate into her role. The catering organised by Ann and Chawki and supplemented by some of Martin's breakfast treats was appreciated by all. What a pleasant way to spend a lazy Sunday morning. Following breakfast, Rana led a guided tour of the Mountains to Mangroves section of the Gardens and the newly created 'Story of our Country' garden and the bush foods garden. Members also took the opportunity to inspect the Rotary Education pavilion, which is now complete with the final interpretative panels recently installed. Check out the photos taken by Genik. 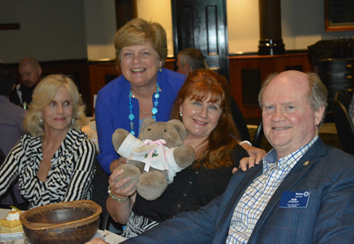 President Lynda was at her effervescent best as she thanked the club members for their various gifts to the world during her year of presidency. 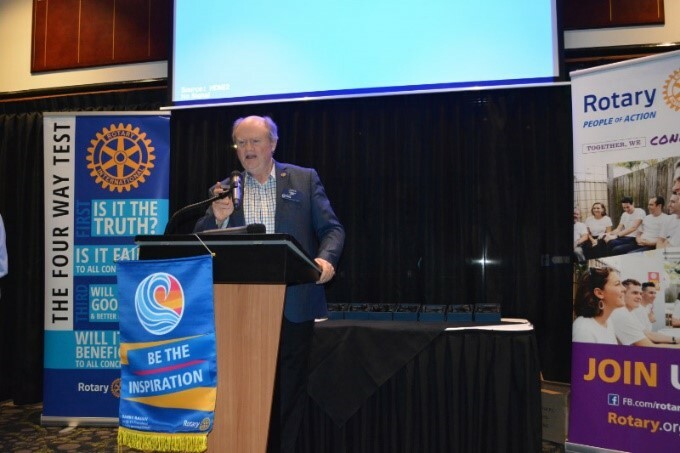 In responding to John Lander's toast to Rotary International Past District Governor Graham Jones praised the club's achievements over the past year. 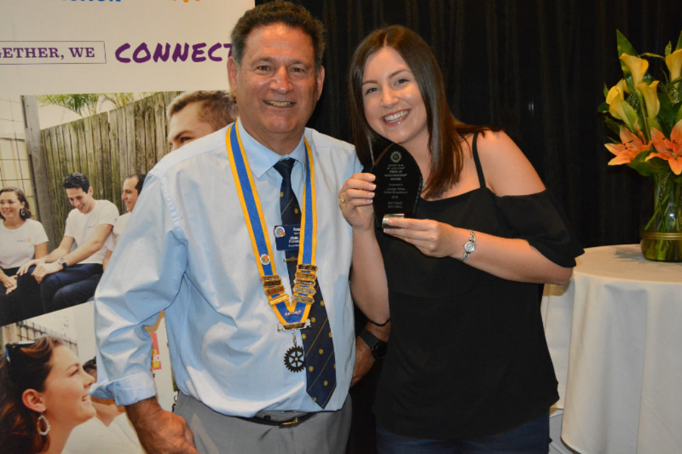 Lynda appeared to reluctantly hand over the presidential collar to Kate Kimmorley who provided a short overview of her goals for the year before introducing her new Board, which included several newer members. A wonderful event run in partnership with 92.5 Gold FM to raise funds for Give Me 5 for Kids Charity and Gold Coast Rotary community projects. 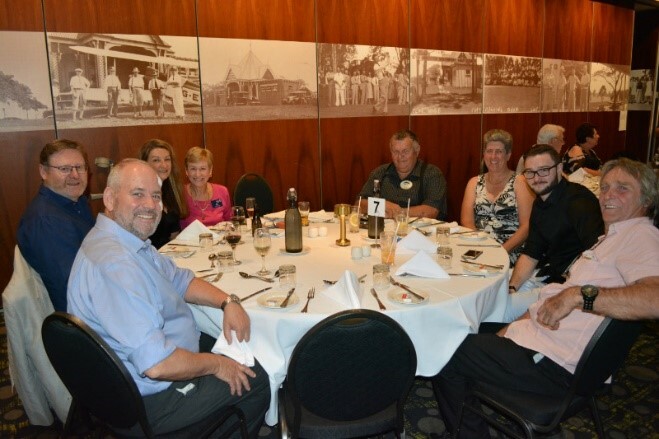 Guests were superbly looked after by Sofitel Broadbeach and entertained by President Lynda and the Groove Doctors band. Raffles, silent and live auctions raised over $20,000. The electronic on-line bidding system designed by ClearIT Solutions encouraged spirited bidding and automatic updates on the big screens. and the audio visuals by AV Partners were faultless. Special thanks to Apple Marketing who sourced most of the silent auction items. Thank you to Birkbeck Jewellers, 92.5 Gold FM and Spida, Witches Falls Winery, and John D'Anna for the wonderful live auction lots. 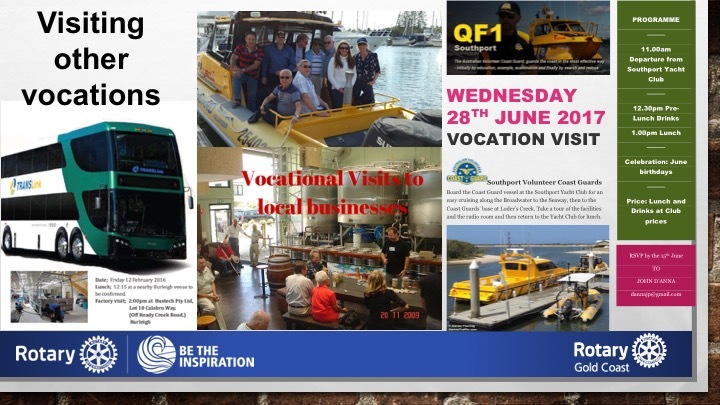 Gold Coast Rotary believe “Pride of Workmanship” - the sense of responsibility to do a job well, (Do it Once - Do it Well) is one of the greatest intangible assets in our community. 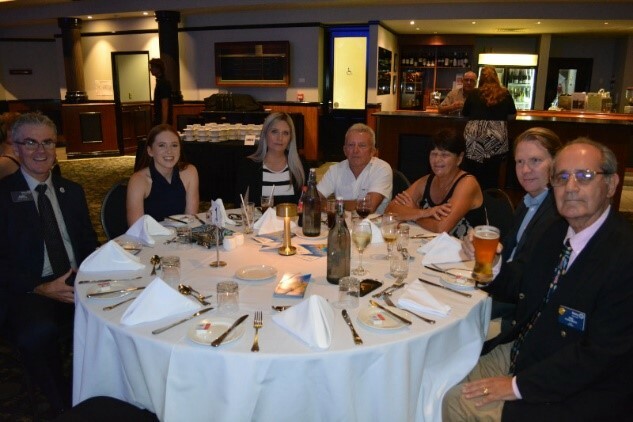 As part of our campaign to encourage the “Pride of Workmanship” theme, seven employers gave recognition to nine employees at a well attended Awards Dinner at the Southport Golf Club on 21 April 2016. 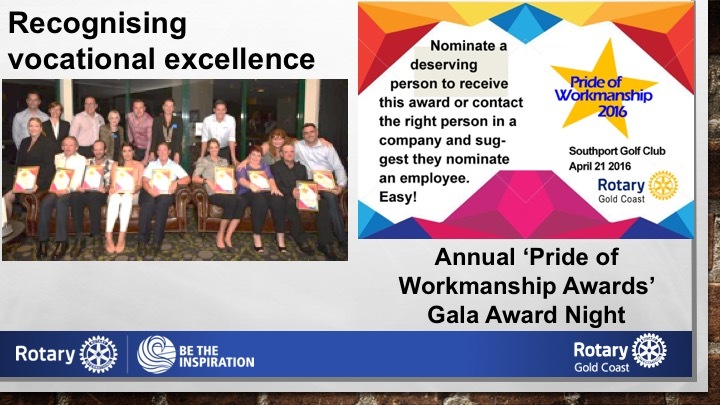 More than 70 members and guests gathered to hear a short tribute to each awardee before they were presented with a framed certificate acknowledging their contribution to their workplace. 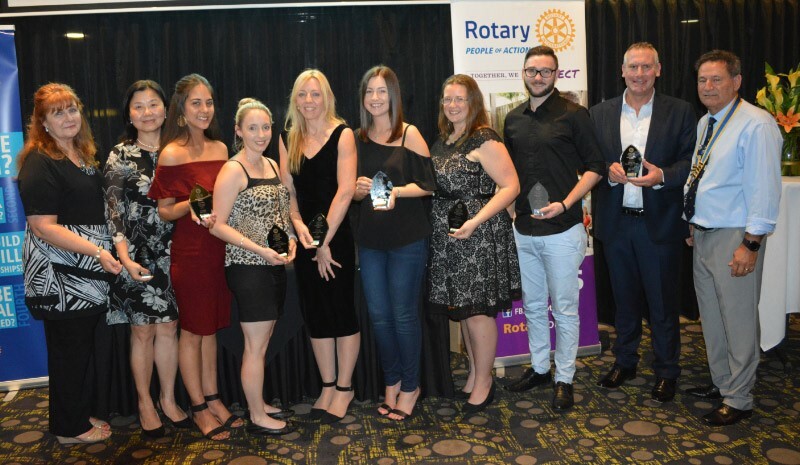 Awardees represented the following organisations - Sofitel Hotel Gold Coast, Australian National Industries, Mariner Shores Resort, Crema Express Robina, Queensland Police, PhysioFit Main Beach and Delab Construction Services. Alex Jakimoff, President of the FGCRBG, Gene Rosser – Patron of the Friends, and past presidents of FGCRBG Kate Heffernan and Nick Bloor. The opening of the Rotary Education Pavilion has been a long time coming. Even longer for Justin Schaffer who donated a significant sum of money to our Rotary club back in 2008 to be used to provide ongoing education programs for young people in an area not catered for by main stream schools. 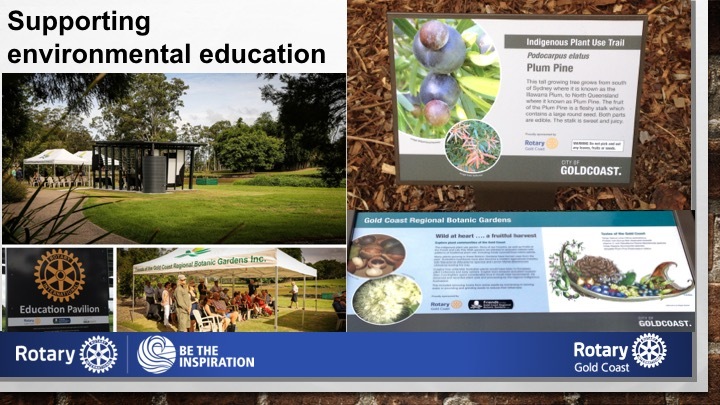 After several false starts we identified the need for a multi-purpose shelter within the Gardens for use in education programs and for housing interpretative displays. We did not want a standard picnic shelter that you find in a park – we wanted a signature structure befitting of a Botanic Gardens and something, which acknowledged Rotary and its community service. Justin was proud to officially open a signature structure designed by Andrew Brewer from Burling Brown Architects. He gave a moving speech, advocating philanthropy and thanking Gold Coast Rotary for its support and perseverance in bringing this pavilion to fruition. President Lynda had much pleasure in presenting Justin with Honorary Membership of our club. 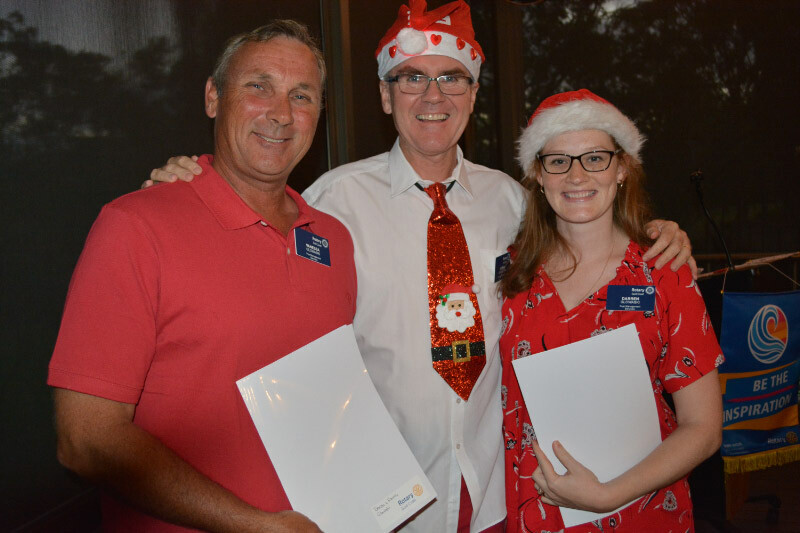 Alex Jakimoff then presented both Justin and the Rotary Club of Gold Coast with Life Memberships of the Friends of the Gold Coast Regional Botanic Gardens. The support of Councillor Paul Taylor was acknowledged before Kate Heffernan talked briefly about, and then unveiled her latest creation – stage 1 of the interpretation signs for this pavilion. Dr Liz Caddick the Curator of the Botanic Gardens rounded out the program by explaining the importance of education in the charter of Botanic Gardens and how the pavilion would provide a valuable resource for future programs. Drinks and fellowship followed. Nice to get recognition in local paper. 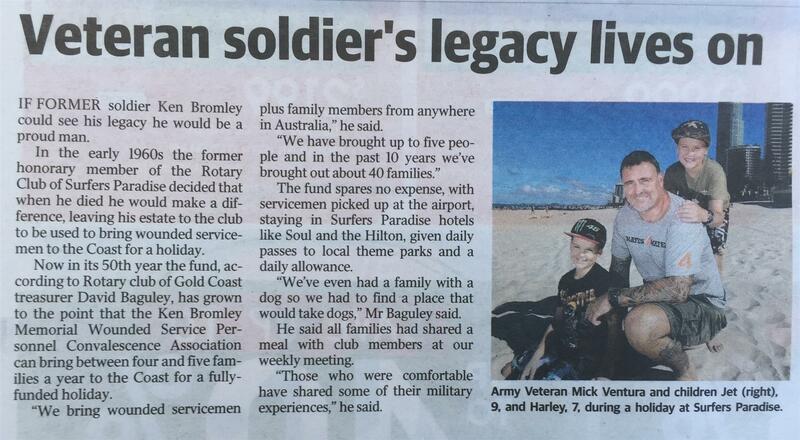 Another soldier and his partner from Perth have just enjoyed a wonderful break on the Gold Coast courtesy of our program. We donated our left over Bulls on the Beach Jackets ( 30kg in weight) to Deb and Matt Water who volunteered their time to run our rodeo food tents. 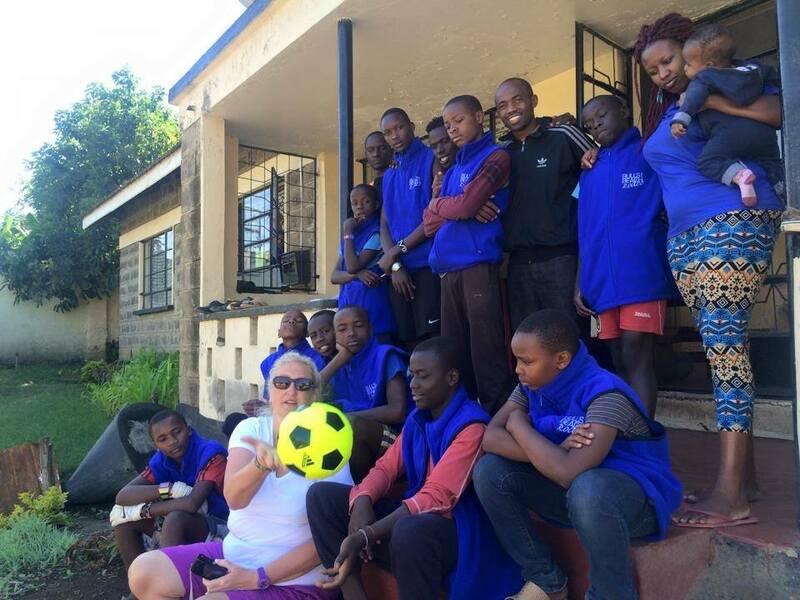 They have recently travelled to Africa as part of the Kenya Health program. The jackets were very well received. 50 years of Rotary holidays for wounded service personnel. 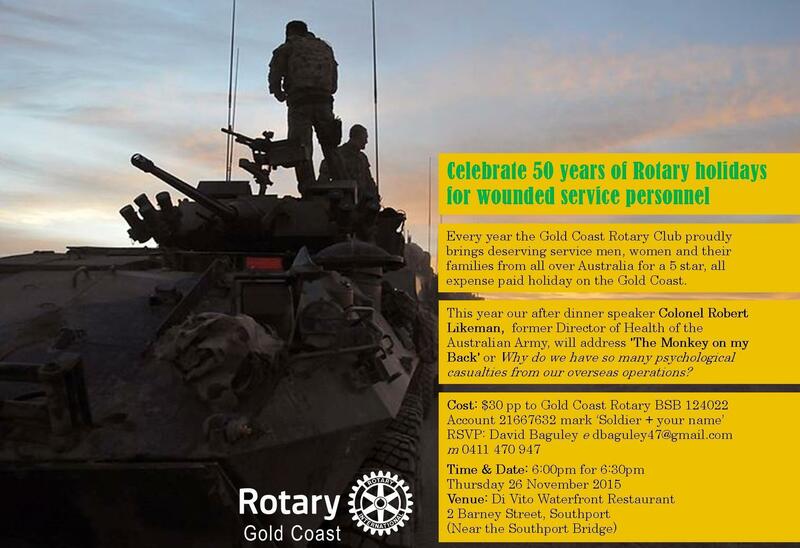 In 1965 following Australia's involvement in the Vietnam War, the Rotary Club of Surfers Paradise established the Wounded Servicemen's Scheme. The scheme was started by Rotarian Griff McKay, ably assisted by ex-servicemen Ken Bromley and Charles Smith. At that time the the scheme was confined to Australian soldiers receiving treatment at the Yeronga Military Hospital. Ken Bromley, an ex-Naval officer took over the chairmanship in 1971 and was honored with an M.B.E. for his dedication to the cause. Between 1965 and 1973, a total of 1496 servicemen enjoyed rehabilitation on the Gold Coast. 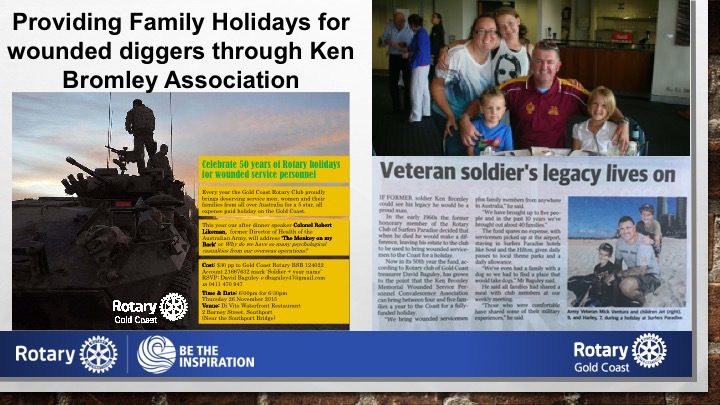 The scheme has been continued by the Rotary Club of Surfers Paradise Central and then the Rotary Club of Gold Coast through the Ken Bromley Memorial Wounded Service Personnel Convalescent Association, whereby wounded service personnel accompanied by nominated family members receive a fully paid 5 star holiday on the Gold Coast from anywhere in Australia. Service personnel who have served in many overseas areas of conflict have benefited from this program. At one stage even British service personnel wounded in the Falklands conflict enjoyed Gold Coast holidays. Come and join us on 26 November at the di Vito Waterfront Restaurant to celebrate this milestone. Bookings essential.